His collection of unsolved reports (not yet debunked, as he would put it) provides the name for the podcast. The stories of lives that unfold in each episode are fascinating, and if the description I’ve given strikes any interest in your heart I advise you to stop here and listen to the series. It’s a very special thing to experience without any foreknowledge. Still here? Well, then let me add one more fact. Those of you who’ve not listened to it and skipped down here anyway are no doubt giving me a mighty no duh expression. 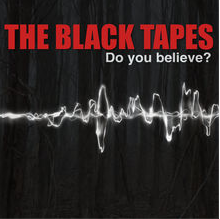 But The Black Tapes is not a series eager to expose its provenance: the episode credits are fashioned to have been completed by “in universe” characters, with the actual writers listed as producers; Alex Reagen and Richard Strand both have Twitter accounts and unnamed actors, and Strand answers questions from real life listeners in-character; there’s even a website for the Strand Institute. And there’s the show’s less overt appeal to credibility as well – Alex’s alto voice and soothing cadence very much recalls reporter Sarah Koenig from the famously nonfiction Serial, as does the simple, plonky background instrumental that serves to tie scene breaks together. While it never lies to you directly (and the real source of the series can be found with a slightly more than cursory Google search), careful steps of circumstantial evidence were clearly laid out to nudge people to a certain surface-level conclusion. To indulge in their own apophenia, if you will. It’s a brilliant marriage of form and function. The podcast begins with its foot squarely in reality, after all, more concerned with what drives people to hunt ghosts than the ghosts themselves and happy to let Strand thoroughly debunk the lead-in haunting. And its very first “black tape” is cribbed more or less directly from the internet’s favorite urban legend. The script is very good at asking “what if,” at offering familiar territory and plausible mundane explanations for the strange incidents before us (helped along by the truly top notch acting of the cast). And while it does that, it also gently slips in a growing pile of implausibility that the listener might not even know they’re adjusting to. Strand’s one million dollar prize for proving the paranormal? That actually exists, albeit offered by the James Randi Educational Foundation. The audio is unusually clear, and the people Alex speaks to are pretty universally well spoken? Well, it’s a public radio series headed by a professional team. Of course they’d pick the best audio they had and trim the “um”s. Strand’s unusual willingness to come back after his fight with Alex over his personal life? Editing to make the timeline of the makeup cleaner. The frequency with which Strand acquires new cases? Well, we don’t know exactly how the production and release schedules match up, and he does have that back catalogue in the office. The abundance of mood-setting background tracks? I mean, Serial already did it (and Alex and her producer sitting down to openly discuss the ethics of their investigation may be one of my favorite lowkey jabs of all time). By the time the spooky kid from episode two winds up kidnapped and taken to an isolated cabin rigged for demon summoning, you’re about ready to believe it. It’s not tenable forever, of course. Once a significant portion of the cast has recurred and Alex is talking to an old contact who winds up with a notable slip in her Russian accent (indeed the entire Russia plot – engrossing stuff, but flown free out of the realms of any kind of dismissible possibility) the cracks in the show’s plausibility begin to show, and pretty much shatter entirely with a big wink to the audience during a break-week Q&A (“It’s not like we’re actors” wink nudge). And while I confess the initial dawning of the show’s fictional nature was, for your gullible host, a bit like realizing about Santa all over again, I don’t actually consider it a failure on the show’s part. The blending of fiction and reality simply cannot go on forever, and the show doesn’t seem to be interested in pulling a fast one so much as demonstrating how these sort of hazily detailed myths get started, as well as what maintains their ability to fascinate. The fact that it accomplishes something that should be impossible so skillfully is a separate, equally interesting matter (after all, while we do theoretically have the world’s information at our fingertips, how many of us bother to check it when we’re presented with an engaging, seemingly trustworthy story?). Regardless, it makes its transition with relative grace, seemingly done with an eye both for the amassing evidence of demonic portals and the potential for further seasons of perhaps more purely outlandish stories. And wherever it goes in the future – indeed, even if this one story arc winds up being the whole of things – it will stand both as a metafictional accomplishment in podcasting and a damn fine spooky story. Oh man, I am so happy you introduced me to this podcast. I am always looking for new shows to listen to when I work. Was already a fan of Nightvale, and blew through a relisten in about a week or so. This show is excellent, unfortunately, already in the “waiting for new episodes” phase. It really is amazingly well done. I listened to all the episodes currently available. A great recommendation, as always. Podcasts (or audio drama) might be the ideal format for this kind of meta-fictional screwing around. I’m sure most people are just about critical enough to google a few key words from a written document while reading it, and everyone has experience with manipulated video, but there’s something inherently distancing and reliable about audio. Maybe that’s why it worked so well for Orson Welles. In general, I’m a little wary of explicitly supernatural films and shows that feature skeptic characters. I get why you’d want to do it from a dramatic point of view since it gives you an anchoring sense of realism and the outline of a character arc, but at the same time it feels like popular culture is training its audience to assume the skeptic is always wrong. Maybe the meta elements here negate that somewhat, and if not, we’ll always have Velma Dinkley. That is certainly a way to react to finding out that Satan, Slender Man and the bad guy from The Exorcist aren’t in cahoots to invade Earth. Truly, a woeful moment. I do think the show falls a bit into letting Strand be a groan-worthy skeptic once you see the fictional strings at play, but the hints that it’s tied into some grievous mistake he’s made go at least part way to trying to alleviate the pain of that trope (and I agree, the trouble with knowing how fiction is meant to be read pretty much guarantees that one side will look like an unpleasant, unbelievable idiot. On the other end of the spectrum, the movie Paul is pretty unpleasant about it). Listening from London….thought it was real at first….